The attorneys at the general practice law firm of Mularski, Bonham, Dittmer & Phillips, LLC, in Gahanna, Ohio, combine more than 100 years of experience to provide knowledgeable representation for people with a wide array of legal matters. One of our practice areas is personal injury cases. We have successfully recovered millions in settlements and jury verdicts for clients. Some of the scenarios we handle include automobile accidents, slips and falls, and wrongful deaths. In addition to personal injuries, our law firm intervenes in family law concerns. We regularly take on cases pertaining to divorce, child custody, child support, alimony and adoption. Our attorneys also assist with modifications and juvenile issues. In some instances, we are able to leverage mediation to resolve conflicts without going to trial. Additionally, we provide estate planning and probate services, such as wills and trusts. Beyond these practice areas, our attorneys are skilled in business law and litigation. We represent small-business owners and corporate clients in matters ranging from formation to contract disputes. Our firm also handles debtor and creditor issues, including bankruptcy. Lastly, our law firm provides aggressive defense for criminal charges and traffic violations. No matter what brings people into our office, we welcome them to arrange a free initial consultation to discuss their cases. 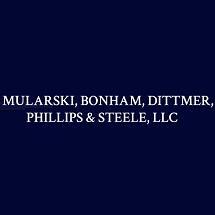 Mularski, Bonham, Dittmer & Phillips, LLC, works with clients across central Ohio and the Columbus metropolitan area. We take credit cards as an accepted form of payment. Our firm is a debt relief agency. We help people file for bankruptcy under the U.S. Bankruptcy Code.